Download the PDF Converter Manual. Step 1. 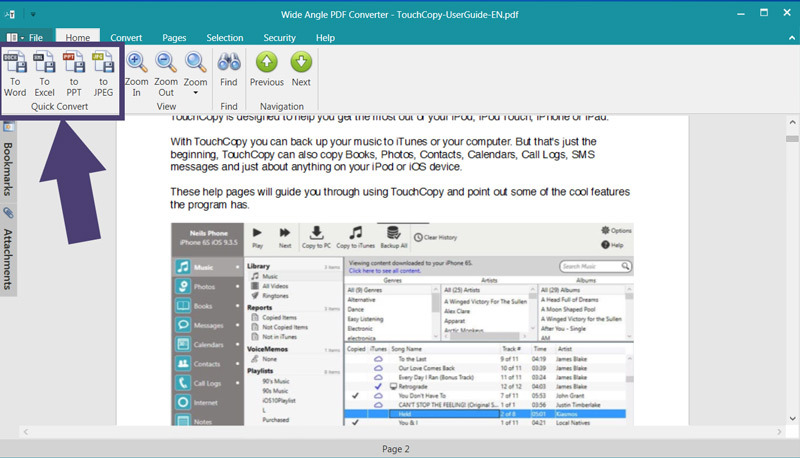 Download and Install Wide Angle PDF Converter. Step 2. Run PDF Converter by double-clicking the icon on your desktop, or finding it in the relevant folder. Step 3. Click Open Document and select a PDF document from your computer. Step 4. Chose a format to convert to from the "Quick Convert" menu in the toolbar (more format options can be found in the Convert tab in the toolbar). Step 5. Select where to save your converted file to on your PC, then click Save. It's as easy as that! If you wish to edit the PDF file before you convert it, please see our Pages section further into this user guide. If you need to convert to a different file type, check out how to convert PDFs to other formats. To unlock the full, unrestricted version of PDF Converter, you'll need to activate the program. If you have already purchased a licence from our store, you will have received an activation code via email. 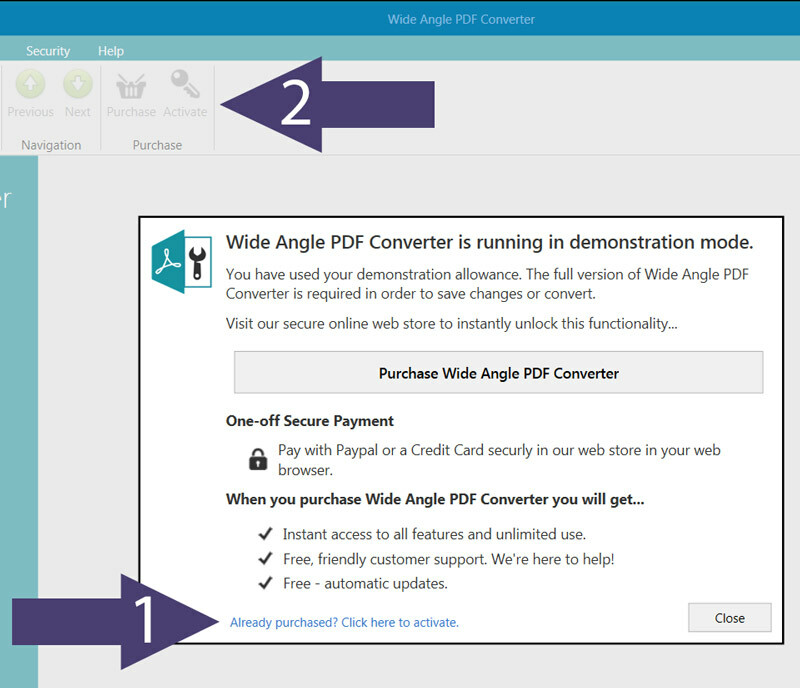 If you would like to purchase a licence for PDF Converter, please visit our store page. Your initial download will run in the demo version, which is restricted to 2 free document conversions. When your free copies have been used, you'll see the message below, prompting you to activate the software. If you already have your activation code, you can hit "Already purchased? Click here to activate" (1). Alternatively, you can activate at any time, by going to the Home tab in the toolbar, and clicking the Activate button (2). To retrieve your activation code for your purchase of PDF Converter, you can use our Activation Code Lookup Service.